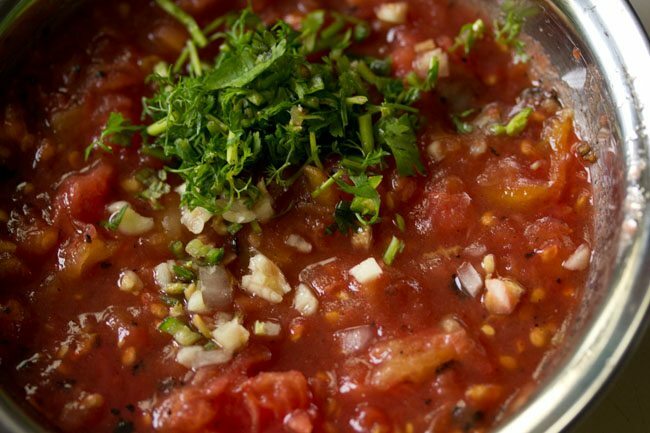 tomato chokha - a smoky relish or bharta made from fire roasted tomatoes, spices and mustard oil. tomato chokha recipe with step by step photos – a smoky relish or bharta made from fire roasted tomatoes, herbs and mustard oil. 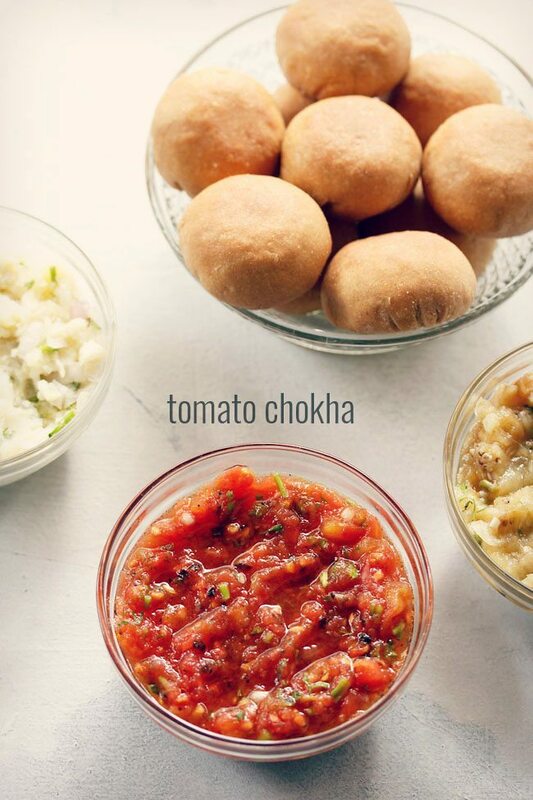 tomato chokha is served with litti chokha and comes from the cuisine of bihar and jharkand in india. i had got some requests for litti chokha. so after many many days, i finally decided to make litti chokha. along with litti chokha, i also prepared tomato chokha, aloo chokha and baingan chokha. will add the recipes one by one. 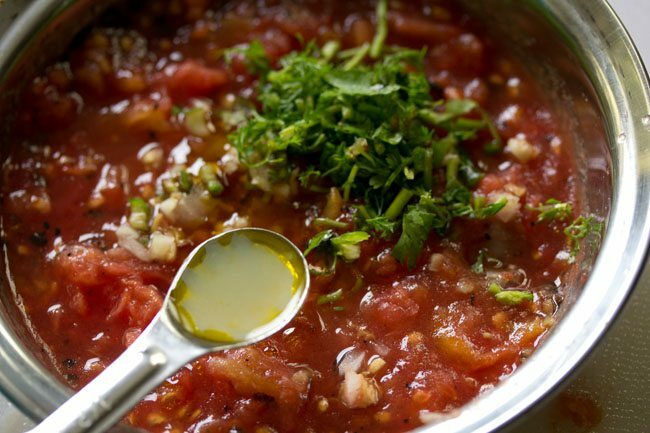 now this tomato bharta is not your regular tomato bharta. its very different. 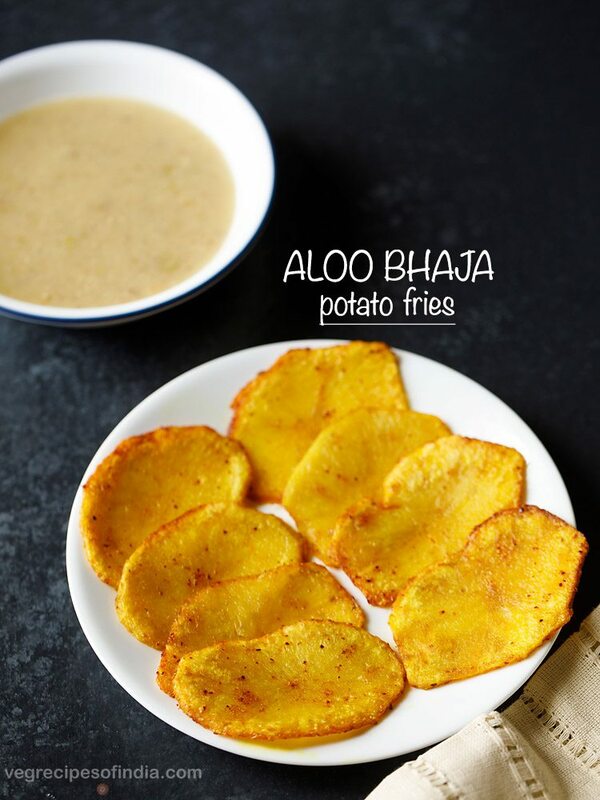 rustic, smoky with robust flavors coming from mustard oil, garlic, green chilies and lemon juice. totally yum. apart from serving tomato bharta with litti chokha, you can also serve it with paratha or even rotis. 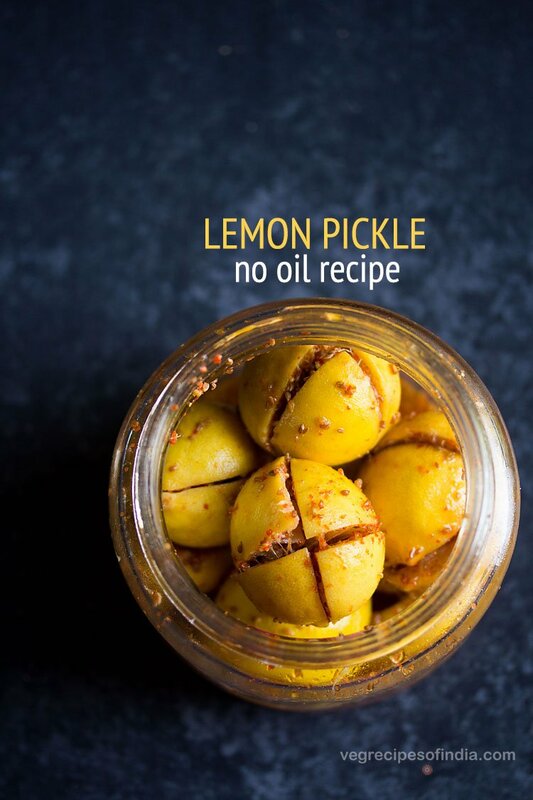 you can also serve it as a side relish with dal-rice. the recipe is very quick and easy and gets done within 15 to 20 minutes. rinse tomatoes very well in water first. then place them on a wired grill rack and begin to roast the tomatoes. you can also place them directly on the stove top. you can also grill the tomatoes or roast in the oven. but then you won't get the smoky flavor. turn them after a few minutes for even roasting. the tomatoes should get charred. roast the tomatoes till they are completely cooked from within. with a knife check the doneness. 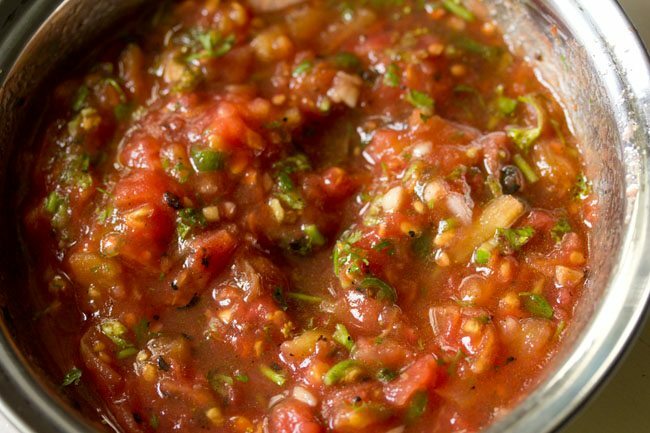 the knife should slid easily in the tomatoes without any resistance. 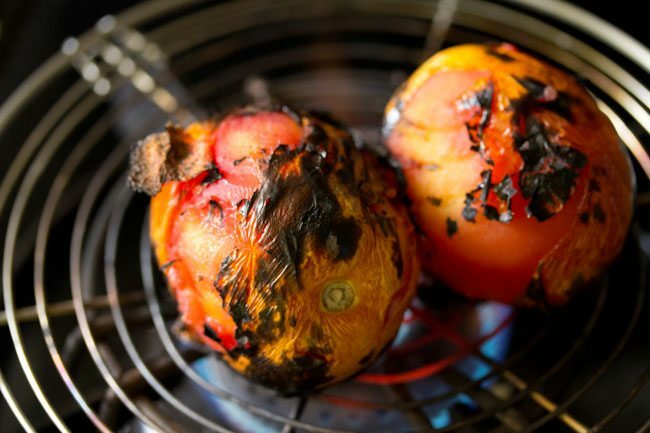 once the tomatoes cool, then peel them and remove the charred skin. 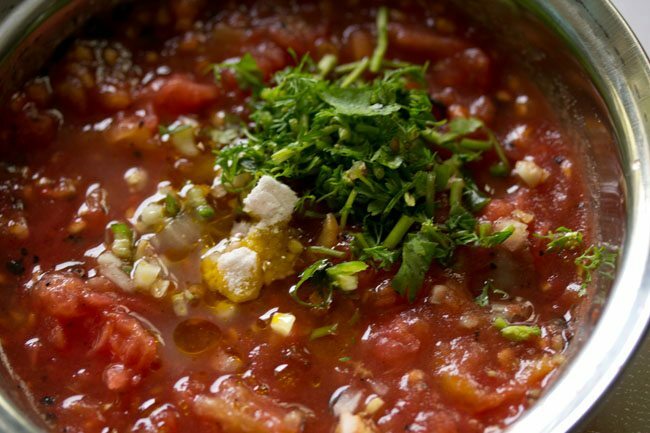 chop them and add the chopped tomatoes along with its juices in a mixing bowl. add 1/2 teaspoon chopped green chilies, 1/2 teaspoon chopped garlic, 1 tablespoon chopped coriander leaves, 1/2 teaspoon mustard oil and 1/2 teaspoon lemon juice. season with salt as per taste. mix very well. 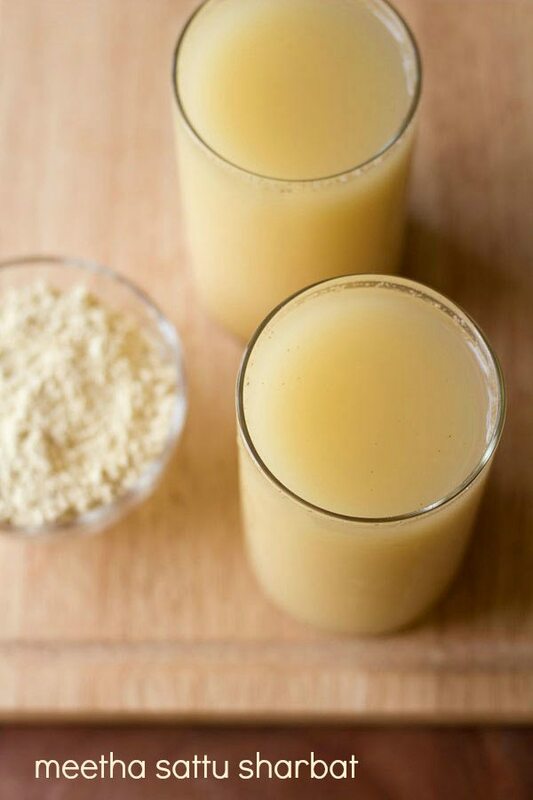 check the taste and add more lemon juice or mustard oil or green chilies or salt if required. 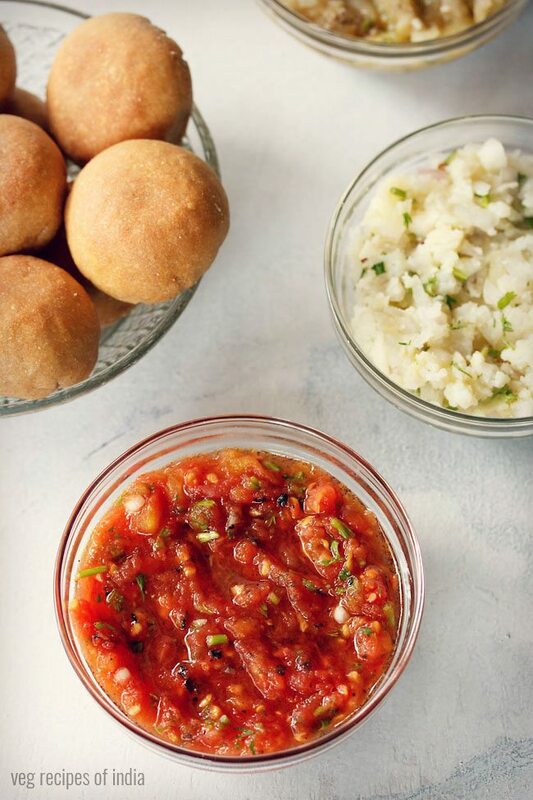 serve tomato chokha or tomato bharta with litti chokha or sattu paratha or even regular paratha (plain or stuffed) or chapatis. 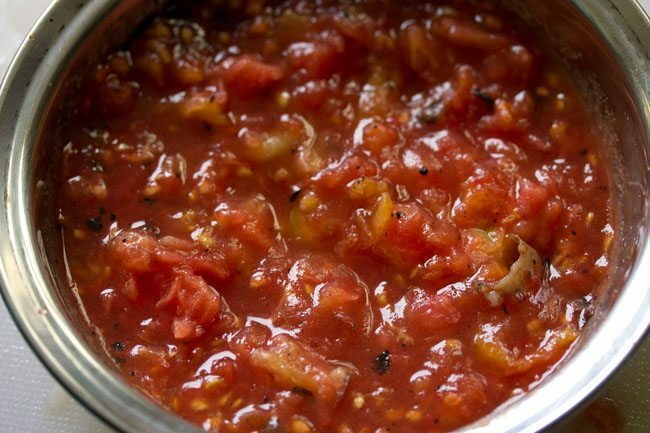 1. rinse tomatoes very well in water first. then place them on a wired grill rack and begin to roast the tomatoes. you can also place them directly on the stove top. you can also grill the tomatoes or roast in the oven. but then you won’t get the smoky flavor. 2. turn them after a few minutes for even roasting. 3. the tomatoes should get charred. 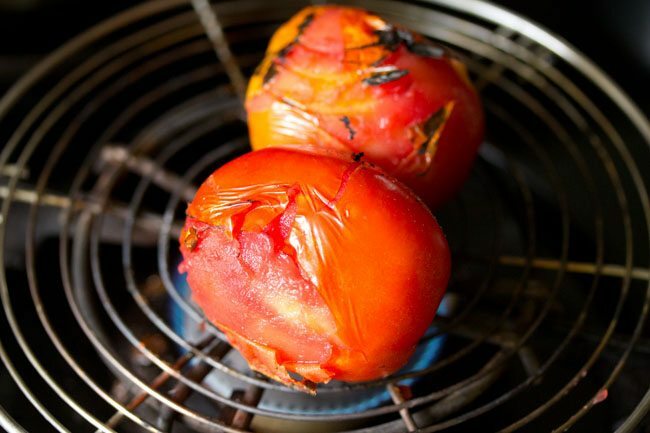 4. roast the tomatoes till they are completely cooked from within. 5. with a knife check the doneness. the knife should slid easily in the tomatoes without any resistance. 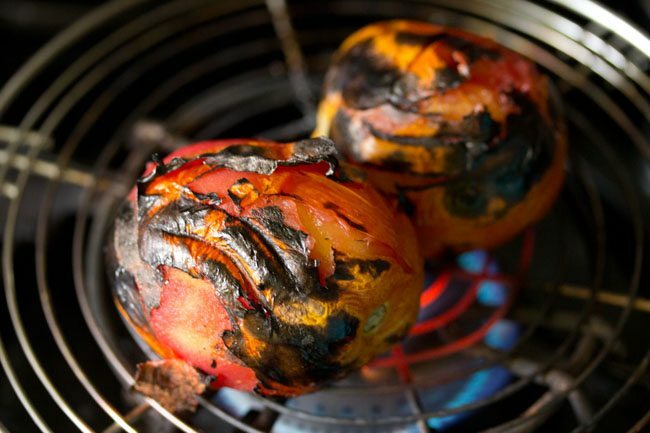 6. once the tomatoes cool, then remove the charred skin. 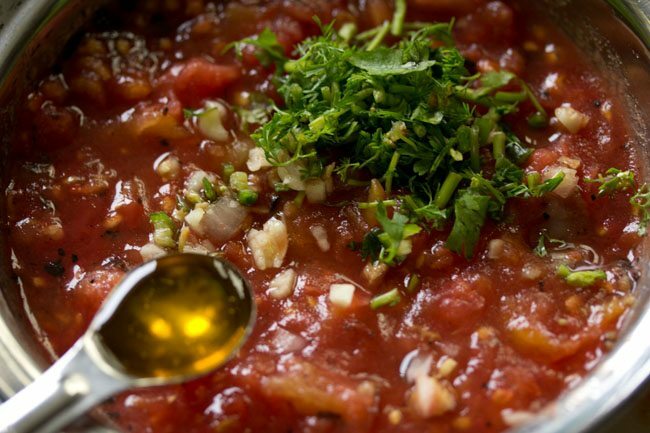 chop them and add the chopped tomatoes along with its juices in a mixing bowl. 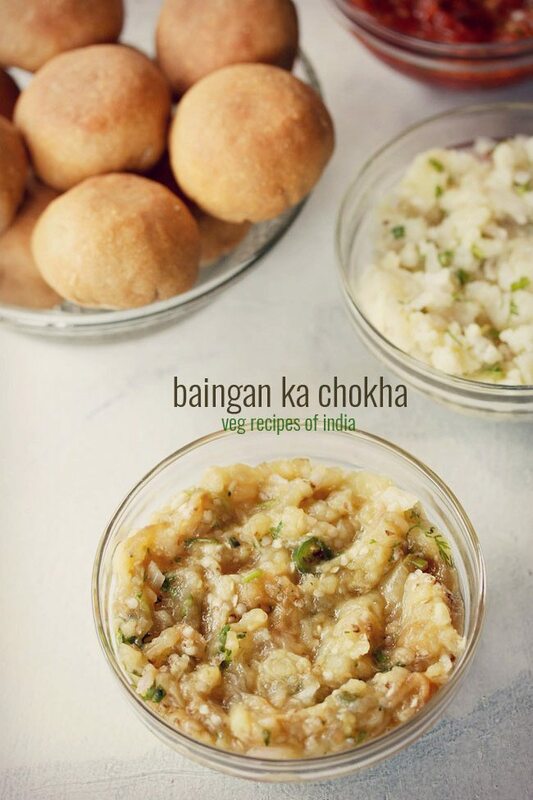 7. add ½ teaspoon chopped green chilies, ½ teaspoon chopped garlic and 1 tablespoon chopped coriander leaves. 8. add ½ teaspoon mustard oil. 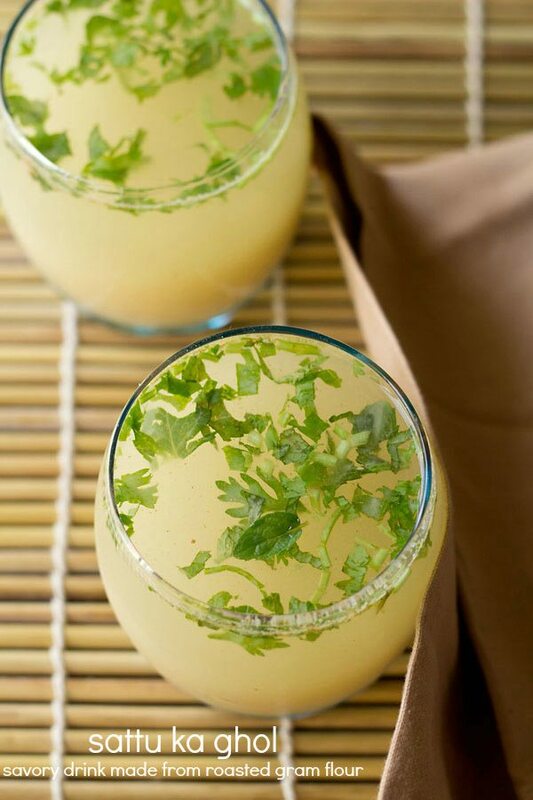 9. now add ½ teaspoon lemon juice. 10. season with salt as per taste. 11. mix very well. 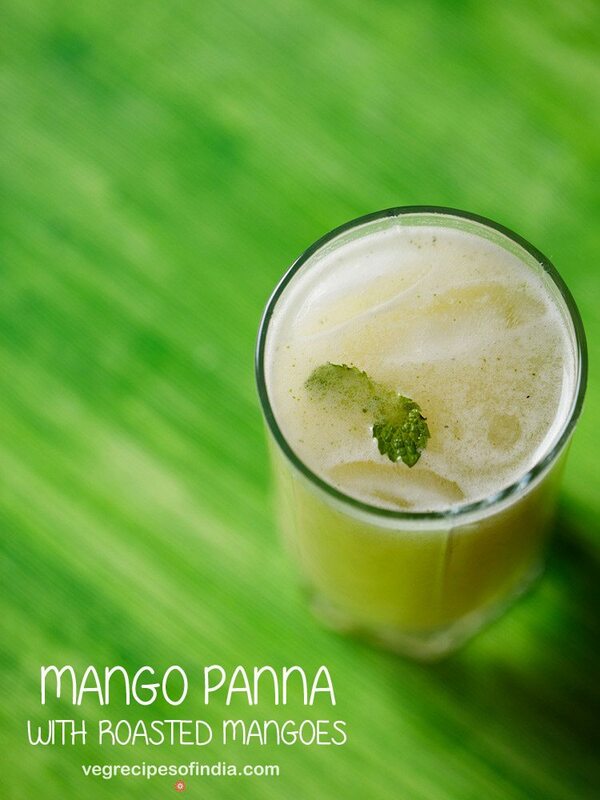 check the taste and add more salt, green chilies, lemon juice or mustard oil if required. 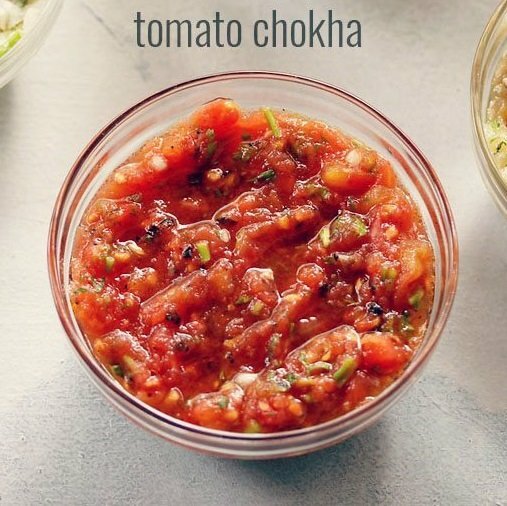 12. serve tomato chokha or tomato bharta with litti chokha or sattu paratha or even regular paratha (plain or stuffed) or chapatis. no. mustard oil gives that special taste which won’t come with any other oil. if you add tadka, it will be like tomato chutney type. will tadka the recipe will taste different. This does look totally yum! Am eager to try making it soon! I have a question about using mustard oil; I have always heard that it must be heated first before using in a recipe. Can I use mustard oil directly from the bottle in this recipe or do I heat it first to reduce its pungency? Thanks! Am an ardent fan of your recipes! thanks a lot. i have used directly as thus the pungency is felt more distinctly in this recipe. when mustard oil is heated till it starts smoking, the pungency gets reduced. so if you want you can heat mustard oil and then add.